Army Sergeant First Class Mitchell Melott joined the military because he had a desire to serve his country. He enlisted out of Los Angeles, California in July of 1990 and was honorably discharged in April of 2012. SAPI plate by enemy fire. He was transported by medevac to Balad, Iraq. The leg injury Sergeant Melott sustained during the blast had resulted in a failed limb salvage. In 2010, his left leg was amputated below the knee. Two years after his first amputation, a severe infection to the leg lead to a second surgery, resulting in an above knee amputation. 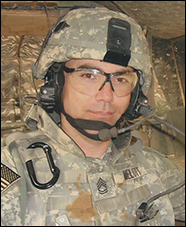 For his service to his country, Sergeant First Class Melott received many commendations including a Bronze Star Medal, Purple Heart, Meritorious Service Medal, Army Commendation Medal, Army Achievement Medal, USN Achievement Medal, Joint Meritorious Unit Award, National Defense Service Medal, Humanitarian Service Medal, Ranger Tab, Combat Medical Badge and Parachutist Badge. Sergeant First Class Melott, his wife Brandi and their children would like to live in Hesperia, California.